1999; 309 pages. Edited by Denise Little. Genre : Anthology; Fantasy. Overall Rating : D.
"Everyone knows that fairy tales, no matter how dark, will always come through with 'happily ever after' resolutions, but are those endings happy for everyone involved? What about the witch, the wolf, the giant, and the other so-called villains who make their homes in the Enchanted Forest?" So goes the prologue to 18 short stories, all fairy tale-themed, and all with a "twist" to them, including several that see how many different FT's they can bring into a single story. Sleeping Beauty, Rapunzel, Prince Charming, and the Seven Dwarves. They're all here and more. How I Came To Marry A Herpetologist. Opening line : "When I first spoke in toads and snakes, I hated them and tried to kill them." For every word she speaks, out pops an amphibian or a reptile. A clever concept. Leg Up. A take-0ff of the Tin Soldier tale. Done in Terry Pratchett style, but of course, not quite as good as the Discworld dynamo himself. Still, a nice story, with two endings. One Fairy Tale, Hard-Boiled. Rumplestiltskin done in "Detective Sam Spade" fashion. He searches for the melfeasant gnome, and runs into a bunch of other famous fairy-tale peeps along the way. A "D"?! How could you give this a "D"?! For starters, there's a couple of quite unnecessary cuss words. Given that this is a book of fairy-tales, one can expect young readers to pick it up. The F-word is uncalled for. Then there are the twists themselves. Perhaps being forced to warp a known FT is too confining. For instance, if you set out to re-write Hansel & Gretel, there aren't a lot of options available, other than turning the kids into brats or villains. However, my main criticism is reserved for the editor herself. 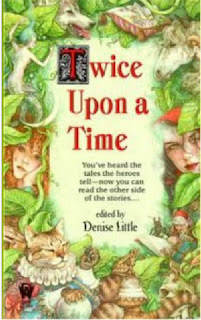 Of the 18 stories, three of them are a re-telling of Jack And The Beanstalk, all with the same twist. Jack's the bad guy, and the giant's the victim. Obvious the first time; royally irksome the third time. Is it too much to ask for 18 different take-offs? How important is the editor of an anthology? I can't recommend this book. I have nothing against Fantasy Anthologies. See here and here for two well-done ones. Notice that Martin Greenberg was involved in both of those. I now have a greater appreciation for the impact he has on a quality compilation. Twice Upon A Time seemed to me to be an amateurish effort. Very few of the stories reached out and grabbed me. I never heard of any of the writers. A lot of their "experience" seems to be collaborations. I wonder if this is a rite-of-passage for authors just breaking into the professional field. For one of them (Ms. Lupita Shepard), her submission here was her first published work. I'm sure that was exciting for her, but I kinda get the feeling she happens to be a personal friend of Denise Little. Bottom line - there are much better anthologies out there than Twice Upon A Time. For now, I think I'll stick with Martin Greenberg ones. Ouch! Sounds rather disappointing. I enjoy getting different takes on favorite fairy tales, but it sounds like these authors take it a bit too far. Three for Jack?! Oh, boy. I think I would've liked the Rumplestiltskin done in "Detective Sam Spade" but I'm guessing it wasn't worth the anthology? the stories themselves probably merit a "C". its the editorship that really brings the rating down. you'd think she would've written back to two of the Beanstalk authors and tell them to pick a different FT.
i like your idea for the H&G twist better. and maybe that's the thing - most of the twists in 2UAT were just too predictable. Martin Greenberg used to edit Asimov's Science Fiction. I used to love reading old copies of those as a kid.